Hanan Ashrawi accuses Israel of oppression after Arab poet Darin Tatour sentenced to prison for publishing a poem inciting to violence. PLO Executive Committee Member Hanan Ashrawi on Tuesday blasted Israel after Arab poet Darin Tatour was sentenced to five months in prison for publishing a poem inciting to violence. "Through her poetry, Darin, a Palestinian citizen of Israel, was exercising her right to free speech and advocating against the cruel and belligerent military occupation. Yet, Israel accused the poet of incitement whilst the occupation is the worst form of incitement,” said Ashrawi in a statement quoted by the Palestinian Authority’s Wafa news agency. “Israel's unjust actions are in grave breach of Article 19 of the Universal Declaration of Human Rights which calls for the protection of the fundamental rights of freedom of opinion and expression,” she claimed. “Israel is rapidly becoming an autocratic and oppressive government and practicing blatant discrimination against its own citizens,” charged Ashrawi. “It is distorting its own legal and judicial systems to promote an official policy based on ethnic nationalism, racism and xenophobia. 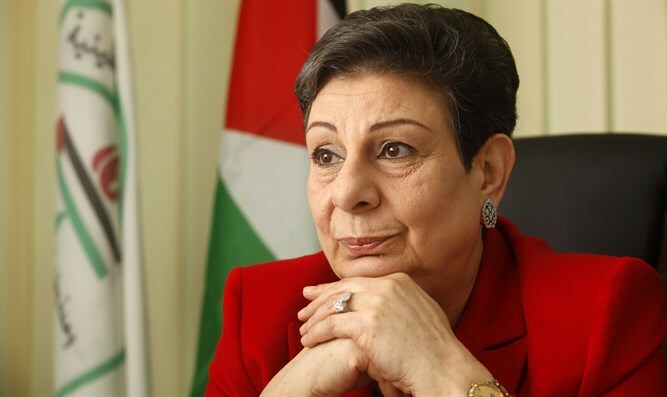 If its violations are not curbed by the international community, it will succeed in cementing apartheid and racial supremacy throughout Israel and occupied Palestine," Ashrawi concluded. Israel is working to approve the "Facebook law," which would allow Israeli courts to order the removal of online incitement on Facebook, including advertisements, and would declare all incitement to be a criminal offense if it endangered a person, community, or the State of Israel.